Ernest Hemingway famously lamented writers that hadn’t learned “how to say no to a typewriter”. The Elements of Style, one of my favorite books on writing, advises that we “Omit needless words”. While that may be easy to agree with, it is quite hard to live by, especially for those with limited or no access to a skilled editor. Self-editing is difficult! Enter the Hemingway app. 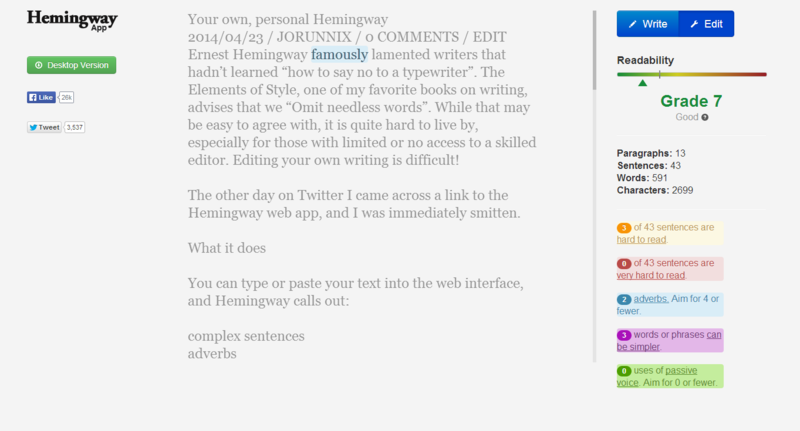 I first came across a link to the web app Hemingway on Twitter, and I was immediately smitten. Hemingway uses an easy-to-grasp color legend to signal where the issues are. Accessibility-wise, this heavy reliance on color coding is of course bad news for colorblind users. An IPCC fact sheet. Hemingway gave it a “10 Good” and minimal highlighting, which I think is an impressive result given the subject matter. The Wikipedia entry on Client-server architecture. Hemingway said “14 OK”, with some very complex sentences and a few uses of the passive voice. A random piece of Buffy fanfiction. “5 Good”, although containing a rather high number of adverbs. This blog post, which I kept re-testing until I was happy with the result. The first draft got “11 OK”, with a few complex sentences and some fancy words that were better replaced or omitted. You can see the result of the final run in the screenshot above. I have tried with a few different texts and so far failed to get Hemingway to say anything but “OK” or “Good”. I even ran the analysis on a patent document where 74 out of 250 sentences were “very hard to read” and there were 86 uses of the passive voice. Hemingway still found this to be “14 OK”. I dislike spell checkers and the grammar and syntax checking in word processors, and I have rarely bothered to use readability analyzers on my text. This might just be the tool that convinces me to embrace automated readability checking as a supplement to the editing and reviewing I otherwise may have access to. I gather that I like this tool because I feel like we’re on the same team. Clean, helpful, simple writing is what we want, and to that end, the tool has a clean, helpful, simple interface. The app has some obvious shortcomings. The most obvious is that the analysis is not able to call out overall verbosity. A human (and hemingwayesque) editor would immediately strike down on long and repetitive text. I also find the individual highlighting a lot more useful than the readability score, which is often far too kind. If you manage to find a text that gets a terrible score, do let me know in the comments! I will keep trying out this tool with my writing both for work and for this blog. The creators are trying to find out whether there is interest in a $5 desktop version that would be able to save and load files. I have signed up to receive notification when and if the desktop version releases. The Hemingway app may not turn any of us into an author the level of its namesake. For self editing, however, it is probably the most helpful tool I have seen so far. That is a killer idea. Copy/pasting from other apps quickly gets tiresome, and it would reduce the need to develop editing features in Hemingway itself. I haven’t tried Hemingway, so I might be mistaken, but isn’t there already something like this built into the WordPress.com editor? At least, it points out both overly complex sentences and phrases and excessive use of the passive voice. That may well be! I don’t use wordpress.com and haven’t tested it for years, but I know there are some differences between wordpress.com and installing your own WP. It sounds like that is one of them. Does it work well? I think it works very well – for what it is. It certainly helps me break up overly long sentences and avoid abusing the passive voice. On the other hand, it does not keep me from repeating or even contradict myself on occasion. Therefore, I might give Hemingway a try, even if I am a bit wary of an app that never seems to rate anything lower than “Good” or “OK”.